This game was so fun that when I was going to end the recording, I said screw it and kept going because I was enjoying it so much! I definitely plan to make this one a series because I adore it! Oh my gosh~ The detail in this game! I love the small little easter eggs like if i make my name Sosig i get different dialog. and how the main menu changes if shadow soosig gets you. amazing game! Been waiting till the spoopy Halloween season to play this series and it's just so cute, charming, and funny, I can't wait to play more adventures of these two goofballs! Iv'e not played a visual novel this adorable before, being as most are on the side of satire. 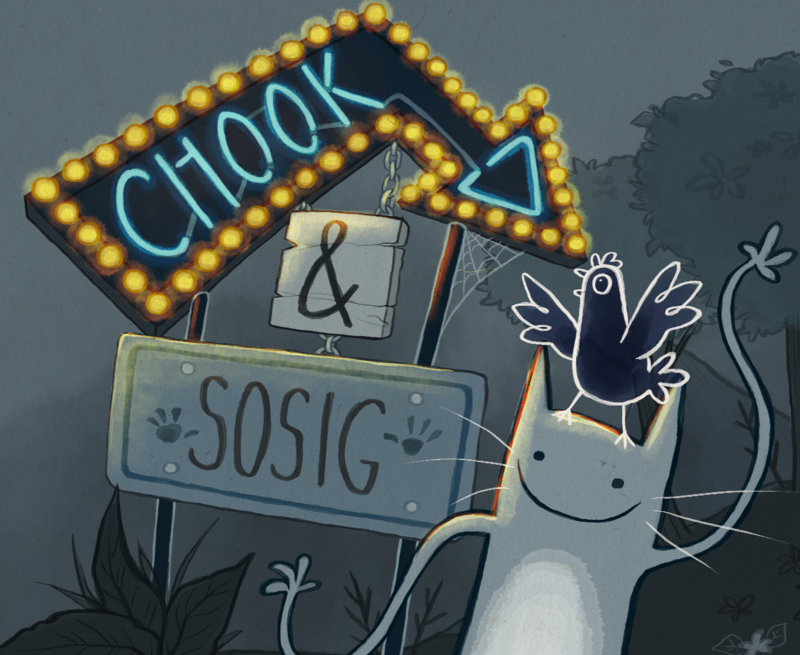 Chook and Sosig destroyed my expectations to be both light hearted and hilarious. Definitely worth playing, and if you have the scratch like I do, pay for it. The developer has something special here that I hope he continues to perfect and solidify it. Here's part 2 of my Chook & Sosig Let's Play! This game was fun to play. I also made a vid of when I played it. I hope you keep making fun games like this!! Hello Ninetails! The Cow head thrives on all this attention is very pleased. That song sounds far from it. Are you sure it's not Treasure Castle? I just learned there are more and I am playing all of them! Somehow missed this one having already played A Case of Murder, but great stuff again! The duo really are a great pair of characters and I enjoy anything they're in. Nice stuff. Had a heckin' swell time playing this. Got most of the endings, and felt as though they were all worth getting. Loved the open-endedness of things, and theartsyle and music complimented themselves well. Fantastic work, and I look forward to playing the next games in the series! Thankyou ever so much for taking the time to create a video! This game was super fun and I can't wait to see the other alternate endings. Expect more videos!!! Thankyou ever so much for the lovely words & congratulations Omnii on getting all endings! Where do I begin? Well to start, it was fantastic. It was incredibly unique and well done. I can safely say that I haven't played many games like it. The characters are amazing, each one with their own unique personality and story. The story for each section was well written and fun, I enjoyed going through each area and meeting all the characters. I do believe I missed one area though. The art for the game is simply amazing, the character designs are wacky and awesome and the scenes are expertly drawn with an excellent attention to detail. All in all the game was great fun, and I would highly recommend this game to anyone and everyone! I recorded a short "let's play" of the game for my channel, I hope you don't mind. Cheers and good luck from here on, I look forward to many more adventures with these two! Hello Famed Killjoy! Thank-you ever so much for the very lovely and kind words they mean a great deal, I'm ever so glad you enjoyed it and I continue to work hard learning to grow and improve. Thank-you so so much for taking the time to make this video, they are always incredibly useful and valuable for seeing how people react and play (also it's wonderful to hear people laugh). These sorts of videos are invaluable feedback and do a great deal to help shape future work I make. Haha thankyou so much Stockhouse! Twisted at many times, but that's what I loved about it ^^ Definitely giving you a follow! Well that was certainly a fun experience haha, loved getting those endings and loved playing the act. If I see this on Gamejolt I will be happy to support it. 5/5. This Ritual attire is amazing on me! I loved this game, it has a great art style and characters you will remember. I can't wait to play the others and I hope the dev gets more recognition for this game! No problem you have a great thing going and I hope you keep it up! Hey nice game just did a let's play of this game on my channel! I absolutely adore everything about this game, especially the music! Is there anywhere I can find the music you used/made? Oh if only I could make music! I would be really dangerous. Markiplier just played Chook & Sogig!! I saw him play this and Jump Doper and I was like YASSSSS!